Mermaid is the next suburb south from Broadbeach, although it is quieter and has more residential properties and fewer of the attractions and restaurants of its northerly neighbour. Take a walk at sunrise on Mermaid Beach and drink in the beauty and tranquility of the beach at this time of the day. This is a beach where you will often see kitesurfers and windsurfers enjoying the conditions - smooth or calm! Mermaid is ideally located as it is still really only a hop, skip and jump to the attractions of Broadbeach such as Pacific Fair, Jupiters Casino (now known as The Star Gold Coast) and the restaurants on Surf Parade and surrounds. Hiring a car is a good option. Especially if you are planning to see more of the Gold Coast. It is fairly centrally located with many key attractions of the Gold Coast located within 20 to 30 minutes drive. There are some great beach-side apartments to stay in here that are quiet and well appointed. Mermaid Beach has one of the most expensive streets for Real Estate in the Gold Coast - Hedges Avenue. It is worth taking a walk or drive along this amazing strip of coastal real estate. Some of the houses are incredible! Mermaid Beach on a windy day! Mermaid Beach – patrolled beach. Mermaid Beach SLSC - great views, food and good value. Putt Putt Golf – three, 18 hole, outdoor, themed putting courses - Jungle safari, Fun Run with obstacles and Waterways with water! This is a family favourite! Worth booking before hand. Open 9am to 10pm, 7 days a week all year round. Surfing, windsurfing and kite surfing conditions can be really good at Mermaid Beach whether it is a windy day like the photo above or if it is calmer like the photo below. There were several kite surfers on the beach at Mermaid when I took this photo. Mermaid Beach has a selection of motels and some holiday apartments. Mostly in the 3 to 4 stars range with many situated on or near the Gold Coast Highway. Although I am not a great fan of staying on the highway, one of the advantages of being close to the highway is that it is the main route for public transport buses so you can get around the local area and catch these buses to locations such as Surfers Paradise and the Gold Coast theme parks easily. 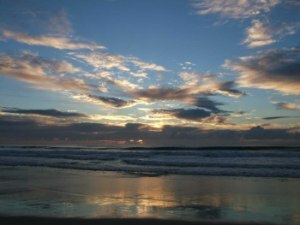 It is hard to determine where Mermaid Beach starts and finishes, so I have included a link to Broadbeach accommodation options and I have included accommodation that could also be listed as Broadbeach, Mermaid Waters or Nobby's Beach. Diamond Sands Resort are resort apartment style accomodation rated as 4 star 1, 2 and 3 bedroom apartments located on the Gold Coast Highway. Heated outdoor pool which I believe it is heated from April to October, through the cooler months and so it must be warm enough during the summer months. There is a heated spa and a heated children's wading pool too. Click Here for more information about Diamond Sands Resort. Turtle Beach Resort (aka Sands Turtle Beach Resort) offers 4½ star 1, 2 and 3 bedroom apartments within a resort setting. A seemingly well set up resort with many facilities catering for the kids and families. If you are expecting turtles on the beach sorry to disappoint - I haven't seen any and you really are not likely to here! It is a popular choice for families with the selection of different sized apartments and its convenient location. The major downside of this property is that it is right on the Gold Coast Highway. You have to cross the busy, noisy highway to get to the beach. This means the beach is a reasonable walk which is not my idea of fun with several kids and beach gear to carry! That aside, this resort is definitely worthy of mention as it is so highly rated. A friend stayed here a few years ago and found the facilites good, though they did have to ask to be moved as their first apartment was overlooking the highway and extremely noisy. There were VERY happy with their relocation and thought the staff very helpful and understanding. Obviously, that is not always going to be possible during peak times. Click Here for more information about Sands Turtle Beach Resort. Montego Sands Resort Apartments is 3 storey Tuscan-villa style 4 star resort with 1 bedroom apartments and large 2 bedroom split level penthouse apartments. Located on Peerless Avenue and only a short stroll down the road and across the prestigious Hedges Avenue to the beach or back across the Gold Coast Highway to Pacific Fair Shopping Centre. The buildings are set around a central courtyard with heated pool and spa. A great location in a quiet street. The other bonus is that the managers are on-site and offer 24 hour check-in, which is really convenient if you are arriving late. Click here to compare rates for Montego Sands. Shaz Maisons are 4 star, 1 bedroom apartments for up to 4 people. Ideal for families or couples. Apartments are tastefully decorated and well maintained. Usually have a minimum 3 night stay and the rates are very reasonable. Well positioned in a quiet road, close to the beach at the Nobby Beach end of Mermaid. Heated outdoor pool is small but functional and great for a dip after a big day of sightseeing or being on the beach! Most rooms are air-conditioned, but check when you book. Click here to compare rates for Shaz Maisons. No golf courses in Mermaid Beach however, there are many Gold Coast golf courses within 20 to 25 minutes drive and the luxury ones are worth the extra drive if that's what you are looking for. Lakelands Golf Course Merrimac 15 mins Usually available for bookings at selected times Monday to Friday only. The Villa Nerang 30 mins Only takes groups - minimum 12 maximum 32. Can play at night under lights. The Grand Golf Club Gilston 35 mins Very Exclusive - you'll have to know someone to get in here! Hope Island Resort Golf Course Hope Island 40 mins At Hope Island Resort - the only links course in the Gold Coast. Emerald Lakes Golf Club Carrara 15 mins 9 holes under lights to 9.30pm each night. Merrimac Golf Course Merrimac 15 mins This isn't a very exciting course - but is very affordable! 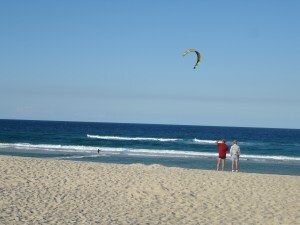 Mermaid Beach has direct ocean beach frontage - it is a continuation of the beach from Surfers Paradise and Broadbeach. A clean beach with great soft sand. Generally beaches are patrolled as follows - but do check as there are changes especially during the summer and winter seasons. Make sure you are aware of the beach and surf conditions and only swim between the flags. Whilst in the area you can support the local Surf Life Saving Club - Mermaid Beach SLS by eating in their great restaurant. Non-members can visit by signing in at the front desk on arrival. Great views and great food, and all for a very worth while cause. Surf Life Saving clubs usually have good breakfasts, lunches and dinners and sometimes entertainment on the weekends. Approximate travel times by motor vehicle - please note travel times can be affected by many factors including traffic hazards and roadworks. These are just an indication. For directions and other information I recommend you use Google Maps Australia. This will open in a new window, select the directions tab and then type in your starting point and where you want to go. I find the format the easiest to use and follow. Not found quite what you are looking for? Mermaid is a little bit away from the action, so if you want to be in the heart of it Surfers or Broadbeach are the best options. Slightly further north is Main Beach which is not as busy as either Surfers or Broadie, but has more accommodation options than Mermaid plus the bonus of Tedder Avenue for boutique restaurants and cafes. If you find Mermaid a bit too expensive, some less expensive options can be found further south in Burleigh Heads, Miami, Palm Beach and down to family favourite Coolangatta. Cooly is a great destination in the southern end of the Gold Coast and has a great choice of apartments to suit most budgets but is not ideal if you plan to spend your holiday visiting Gold Coast theme parks as it is quite a distance to travel. For golfing holidays check out Sanctuary Cove, Hope Island, Carrara or Robina.